This has been such a busy week in Cambridge that there have only been few opportunities to get out from the IOCS conference in Sidney Sussex, and then only for short walks through the cobbled streets to Saint Bene’t’s Church each morning or along Trinity Lane and by the Backs and the Banks of the River Cam at lunchtime. When the conference ended late this afternoon, I went for a stroll first along Sidney Street and Bridge Street, and popped into Magdalene College where Archbishop Rowan Williams is now the Master. Magdalene College was founded in 1482 and refounded in 1542. The first foundation was as a Cambridge hostel for Benedictine monks from Crowland Abbey, to the north of the river, under the shadow of Castle Hill. After the dissolution of the monasteries in 1538, Lord Audley of Audley End founded the present college. I particularly wanted to see the Pepys Building in Second Court, which houses the Pepys Library. It is regarded as the principal ornament of “Mags” and is a building of considerable architectural interest. The building was probably not completed until the early 18th century. The original plan was probably for a more modest, all-brick building until the project was revived in 1677. The diarist Samuel Pepys made three subscriptions to the building fund, although there is no formal evidence of his intention to bequeath his Library to the College, and of his hope to have it placed in “the new building” until his will, dated 1703, just before his death. The back of the Pepys Building looks like a Jacobean manor house, but the front is neo-classical and in Ketton stone. The west front is delightful, but there is a lopsided rhythm to it and it is slightly asymmetric. The middle window on the first floor is not central, the distance between the second and third windows is greater than that between their equivalent pair on the other side, and so on. To each side are the coat-of-arms of two college benefactors, though neither contributed to this building: Sir Christopher Wray, to the left, and Peter Peckard (quartering Ferrar) to the right, both added probably around 1813. Around the corner from Magdalene College, Audley Cottage on Chesterton Lane is named after the college founder. A row of cottages here retains a rustic charm, and some of the pubs along Chesterton Lane and Chesterton Road, such as the Boathouse, take their names from life on the river. After crossing the river at Victoria Bridge, I walked along the south bank of the Cam, with the boathouses on the opposite side, as far as the boathouse of Sidney Sussex Boat Club, and then turned back to stop for a glass of wine at the Fort St George In England (to give it its full name), an old pub on the south bank of the river and on the edge of Midsummer Common. This is the oldest pub on the River Cam. It is a Grade II listed timber-framed building dating in part from the 16th century. The name is commonly abbreviated to just “Fort St George,” but the pub is often known simply as “The Fort.” The full name reflects a supposed resemblance to the East India Company’s Fort St George at Madras (now Chennai) in India. The building dates from the 16th century, with alterations and additions in the 19th century and later. It was refurbished most recently in 2008. It is timber-framed, rendered and painted, in part refaced or rebuilt in brick, especially the east and west gables and the ground floor south front. It is a two-storey building with modern casement windows, three below and five above and one small-paned sash window. Originally the building had a T-shaped plan, but the 19th century additions make it difficult to see this. The first floor has an overhang on carved timber brackets, there are some chamfered ceiling beams, a great central brick stack, and an old tile roof. During the high summer, the pub has a reputation of being rowdy and unpleasant. During many events on the Common, such as Midsummer Fair, it often closes to avoid trouble. But on an early evening like today’s, it was a rather pleasant place to sip a glass of wine and watch life go by on the river. I walked back through Midsummer Common and Jesus Green, and by Jesus Ditch to Park Street, where the ADC Theatre, the home of the Cambridge Footlights. Its initials stand for The Cambridge University Amateur Dramatic Club, the oldest and largest student drama society in Cambridge. The first performances on the site were staged in 1855. As the Club expanded, the students bought the building, originally the Hoop Inn, and turned it into the ADC Theatre. The freehold of the building is still owned by the members of the Club today. 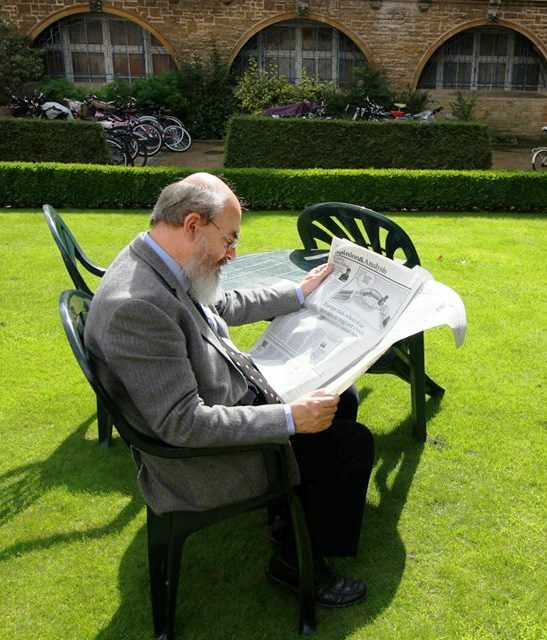 It was just another few minutes before I was back in my rooms in Sidney Sussex College. After wrestling with the differences between dialogue and conversation and the problems of engaging in interfaith dialogue this morning, we started talking at the summer school in Sidney Sussex College this afternoon [2 September 2015] about the different ways of Christians engaging in ecumenical dialogue. The conference came to a close this afternoon with a panel discussion chaired by Dr Christoph Schneider of the Institute for Orthodox Christian Studies. We were challenged us to think of how we can use our imagination creatively in ecumenical dialogue, and offered a model from Greek theatre. With illustrations from the play Oedipus the King by Sophocles, the speaker drew comparisons between Oedipus and Moses. Oedipus is confused about his identity, as Moses is at the beginning of his life. Oedipus goes blind at the end of his life, and Moses never saw the Promised Land. Sophocles never knew of Moses, but there is much common ground in both stories. Greek theatre needs imagination and intuition, and perhaps we need to draw on these too in difficult theological situations, such as dialogue. How do I assert something, and how do I react when someone opposes me, and how do I respond to how I feel? Being aware of these issues allows me to engage in direct encounters in ecumenical dialogue with introspection and intimacy and creativity. There were interesting discussions about Orthodox attitudes to Lectio Divina, and the use of imagination in prayer, which is generally discouraged in Orthodoxy as imaginative and with the danger of delusion or idolatry. But could comparisons be drawn with praying the Jesus Prayer in front of an icon? We also discussed whether the word “antimony” can be used interchangeably in theology with “paradox.” Immanuel Kant popularised the term which for him may be used for something that is theoretically impossible yet nevertheless is. We moved on to discuss the place of anthropology and psychology in theology, and the relationship between religion and science. We were reminded of the well-known saying from Saint Irenaeus: “The glory of God is a human being that is alive; and the life of a human being consists in beholding God” (Against Heresies, Book 4, 20:7). But we also thought about the confusion that arise between nature and grace when we engage in dialogue. We talk at a speed of 200 to 250 words a minute but can listen at 300 to 500 words a minutes. So, when another person is talking, it is easy to get side-tracked by my own thoughts – which may well be triggered by one thing that the speaker says. When I lose track of a conversation, rather than lose face and become embarrassed, I can find myself nodding, smiling and hoping that the other people in the conversation do not notice. Do we listen to each other when we engage in inter-faith dialogue? We faced this question this morning [2 September 2015] at the annual conference of the Institute for Orthodox Christian Studies. Dr Andrejč, a philosopher and theologian from Slovenia, is a Junior Research Fellow at the Woolf Institute, and a research associate at Saint Edmund’s College, Cambridge. 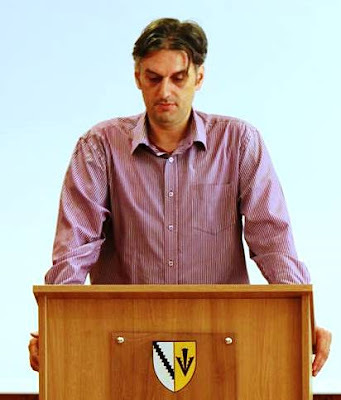 His academic interests include the ways in which religious language, belief-attitudes and felt experience are intertwined, especially in Christianity, and inter-religious and religious-secular relations, especially in Slovenia, Bosnia-Herzegovina, Croatia, and Britain. Before joining the Woolf Institute in 2013, he was a lecturer at the University of Exeter, where he designed and taught philosophy of religion courses. The Woolf Institute is a global leader in the academic study of relations between Jews, Christians and Muslims. The institute was established in Cambridge in 1998, with close links to the university, and once shared space in Wesley House, Cambridge, with the IOCS. Dr Andrejč explained this morning that what is called dialogue is not necessarily dialogue, and how there is a pre-dialogue stage before or instead of inter-faith dialogue. Instead of talking about inter-faith dialogue, he asked, are there times when we should talk about communications instead, for communications need not be trusting, and can even be hostile or aggressive? When we stop communicating, we can keep on talking at each other, even though genuine communications may be lacking. For example, when the Church Father quoted rabbinical sources, there was no dialogue with living Jewish authorities. Yet there had been some discursive encounter, even though it was marked by manipulation and misunderstanding. It happens today, for example, he suggested, when a Serbian Orthodox leader quotes out of context from a sermon by a Bosnian Muslim. There is an encounter even if there is no communications or dialogue. He wondered whether such instances more common than dialogue. What is really going on when people say they are engaging in inter-faith dialogue? On the surface it may look like dialogue, but something else may be going on with people taking positions. He suggested that inter-faith dialogue is different in different cultures and for different traditions. We need to be aware of the different types of communications and interactions between religions that are not dialogue but have positive contributions to creating co-existence. We also need to be aware of who is being ignored and who is struggling to be listened to in inter-faith encounters. Who is invited to the table, and who is excluded? His background is in systematic theology, and has worked in Japan, with a post-doctoral fellowship at Doshisha University, Kyoto, last year [October 2014] and again this year [late Spring-Summer 2015], with first-hand experience of Buddhism and Shintoism. Through the encouragement of Archbishop Rowan Williams, who was his external examiner, he also became involved in the “Building Bridges” project. He drew comparisons and a distinction between “comparative theology” and the “theology of religions,” he looked at Orthodoxy and other religions, and asked why Orthodoxy has not produced much theological work in either field. There has been a long association between Orthodoxy and other religions, living beside other religions in the Middle East, South India and since the 19th century in Japan. There has not been much Orthodox theological reflection drawing on this experience, although he cited examples from John Garvey, Metropolitan Georges Khodr, David Bentley Hart, Alexander Men, Mar Paulos Gregorios, David Flood and Dr Mangala Frost of the IOCS, who spoke at the conference yesterday afternoon. The Vatican paper Nostra Aetate (1965) opened Roman Catholics to engagement with world religions. Why has something similar not developed in Orthodoxy? The development of Orthodox theology has been tied in recent decades to the Russian diaspora, and has concentrated on a neo-Patristic synthesis, with a retrieval of sources in Church Fathers and Liturgy that was grasping for identity. They were interested only in Christianity, especially in the West, and not in other religions. The major figures in this tradition developed their theology in ecumenical dialogue with other Christians, and were closely involved in the early years of the World Council of Churches. He looked at diaspora and post-diaspora theology before asking why there is a need for an Orthodox comparative theology? Well, he said, we are not living in Byzantium, we are living the reality of post-modernity. A second reason is that in secular society today, religions are brought together and forced to deal with one another in finding common cause and in response to civil society. A third reason is created by the persecution of Christians by radical Islam in the Middle East. He summarised the standard Western models of theology of religions as exclusivism, pluralism and inclusivism. Exclusivism says that salvation only comes through Christ by faith, and some adherents hold to double election, while others say there is no salvation outside the Church, and still others are open to the possibility of receiving the Gospel after death (see I Peter 3). However, exclusivism does not answer problems of those who lack access to the Gospel. Pluralists argue that all religions are equal paths to salvation, to God, or to the nameless reality, mapped onto the Trinity. Some pluralists say that all religions are true if they embody certain universal, ethical codes. However, it leaves questions about agnosticism, about dogmatic relativism and about they create what Gavin D’Costa calls a “religious Esperanto” or their own religions. Inclusivists argue that all are saved by Christ, but this may be through being true to one’s conscience or through following after the end of their being but not necessarily through a direct encounter with the Gospel. He looked at the work of Karl Rahner and Sergei Bulgakov in this area. George Linbert is critical of all these models, saying they have a soteriological fixation. He says that completely different religions cannot talk to each other without distorting their essential meanings. The worst-case scenario is that dialogue ends before it even starts. When dialogue continues it often lacks attention to truth or to the presence of Christ in other religions. He finds these models abstract and have typical Western theological obsession with determining whether someone is saved or not. Citing Metropolitan Kallistos Ware, he suggested Orthodoxy has a “trusting agnosticism” on salvation, and sees it as a process. He shared his experience of looking for Jesus everywhere while he was working in Japan. If Christ is at the heart of creation, we need to look for his face everywhere. The Russian theologian Sergei Bulgakov (1871-1944) uses the image of the Temple and its inner circle or Holy of Holies, which is the Orthodox Church, and the outer court, where we find other Christian Churches. They too are ecclesial and part of the Church, with a grain of Orthodoxy and with a relationship to the Holy of Holies. The limits of the Church do not exist, but extend to all creation, and the periphery of the Church is at the ends of creation, where we still see the holy face of Christ. Justin Martyr said in the 2nd century that whatever was well said belongs to Christianity, and seeds of the Word are scattered everywhere. Maximus the Confessor (ca 580-662) said the one Logos is many logoi. How can these ideas be applied to religions today? And can they be applied to non-Abrahamic religions, such as Buddhism and Hinduism? Are they seeking after the One in whom all things hold together? Any Orthodox approach to comparative theology needs to be Trinitarian and Christological, he said. But it also has to be ecclesiological, Patristic, prayer-bent and dialogical. The challenge is in discerning the Cross as the watermark of Divine Love in everything in creation. Each morning this week I have been attending the early morning Eucharist at 8 a.m. in Saint Bene’t’s Church, which is just five minutes stroll from Sidney Sussex College. This morning, the associate priest at Saint Bene’t’s, the Revd Rachel Nichols, presided at the Eucharist. About a dozen people are present each morning this week. After sharing the peace, we move into the chancel area for the Eucharistic prayer, and gather around the Altar in a semi-circle, symbolising physically that though we are many we are one body. As I received the host in my outstretched hand this morning, it struck me that this was the same hand that I stretched out only moments earlier to a complete stranger. The hand that I put forward to receive the Body of Christ is the same hand that stretched forward to receive a stranger as part of the Body of Christ. There are bicycles everywhere in Cambridge, even in the most improbable places. They are on the streets, on the footpaths, chained to church railings, abandoned against college walls, tethered to lampposts, bike rack and street signs, or posing with colourful advertising. Sometimes, you have to watch your back carefully and watch out with caution, because there are even bikes going both ways on one-way streets, all legally, and even making right turns where there are right turns. As I look out the window from my rooms in Cloister Court in Sidney Sussex College, there is a large bicycle shop on Jesus Lane, Primo Cycles, squeezed between two pizzerias. The city has over 30 cycle shops, and there bike hire signs throughout the city, hiring, repairing and selling old and new bikes. Students and tourists alike can hire bicycles from a short-term arrangement like a half-day up to a full term. Many people here boast that Cambridge is the “city of cycling,” and it is said that one in five journeys here is made on a bike. Some people even claim the use of bicycles in Cambridge is the highest rate in the English-speaking world. About 120,000 people live in Cambridge, including 43,000 students. But it is not only students who cycle around Cambridge. The ordinary people of Cambridge – shop workers, office staff, stay-at-home parents, people in the service industries and the professions – all cycle too. The most dense cycle usage in Cambridge is in a few streets in the centre and on routes used mainly by students. So students are partly responsible for the high number of cyclists here. Yet, you might ask, where else would a third of the people agree to being banned from owning a car in the city in which they live? Undergraduates are not normally allowed to keep a car or a motorcycle in Cambridge, nor are they issued with parking permits. Although there are exceptions, for instance for physically disabled students, most students do not drive in the city. This means many cycle shops in Cambridge will have sold out of second-hand bikes within days of the undergraduates arriving back later this month. Second hand-bikes are advertised on notice boards around the University and throughout Cambridge, in local newspapers … even on colourful parked bikes. The many special cycle ways are marked with blue signs with a white bicycle, and this helps cyclists to avoid the busier roads. But the rules for cyclists are confusing, even for people like me who have been coming to Cambridge for years. Some streets allow buses and bicycles only, and many one-way streets are on fact two-way for bicycles. I have to remember to look both ways when I step out the wicker gate in Sidney Sussex College onto Sidney Street – although this is a one-way street for the restricted traffic allowed in, it is a two-way street for cyclists. And yet the law can have its own rigour. It is against the law to cycle at night without working front and rear lights and rear reflector, and it is against the law to cycle with either a broken front or rear brake. Cyclists complain that speed limits are high for cars, cycle-lanes are narrow, cyclists are expected to share lanes with buses, many residential roads are so designed that they are often used by cars as rat-runs, and cyclists often find they are forced to use rough surfaces on busy roads. Shopping streets in the centre of Cambridge are essential parts of many direct and safe routes across the city, but they have often been closed to cyclists. Although some of these streets have been partly restored as cycling routes, some of the one-way restrictions only make sense for cars yet still apply to bikes too. On the other hand, although paths through the parks are narrow and are shared with pedestrians, they are relatively pleasant for cyclists. Cambridge students who cycle are usually young, well-educated and confident but who still need to be careful with their money. Those who form the cycling habit at University tend to continue to cycle afterwards, so cycling in Cambridge also benefits from the fact that many students remain in the city after graduating to work with of the hi-tech companies. However, there has long been a divide between “town” and “gown” in Cambridge, and there is a correlation here between cycling and affluence. Car usage is much higher among “town” people, and for them riding a bike can be seen as an indication that someone is poor. In this way, cycling has become one of the ways that the two groups are identified and divided. Cycling means one is definitely “gown” and in turn many cyclists complain of a high level of intolerance from car drivers. But despite these conditions and complaints, Cambridge remains the city of cyclists and cycles.